Last month, the University College London (UCL) Center for the Digital Humanities and 4Humanities released The Humanities Matter!, an infographic of statistics and arguments for the humanities (see the original post here, and download the PDF here). We now have about 100 extra print copies of the infographic, and we want to send them to you! For free! If you would like to receive a copy, simply add your name to our mailing list using this form: https://docs.google.com/forms/d/1B3C6OE8HlhCGDzbQXUxlzjlwIuDkmw0oHEaMcpQ5ZIU/viewform. First come, first serve – don’t be shy! I’m a doctoral candidate and instructor with the English Dept at the University of New Hampshire. Would love to have one of these for the department! Thanks for your interest! Unfortunately, we are all out of print copies. 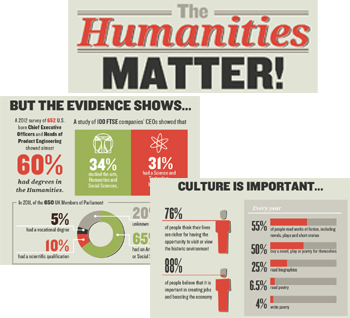 You can, however, download a digital copy of the poster from our site (https://4humanities.org/2013/07/the-humanities-matter-infographic/). Please! Before the NY Times strikes again . ? I wish we had more print copies to give! We could send one to the NY Times….